Aeropress - Brewing Tutorial - Utopian Coffee Co.
A brewing method that perfectly unites full-immersion and pressure to create a one-of-a-kind brewing experience. 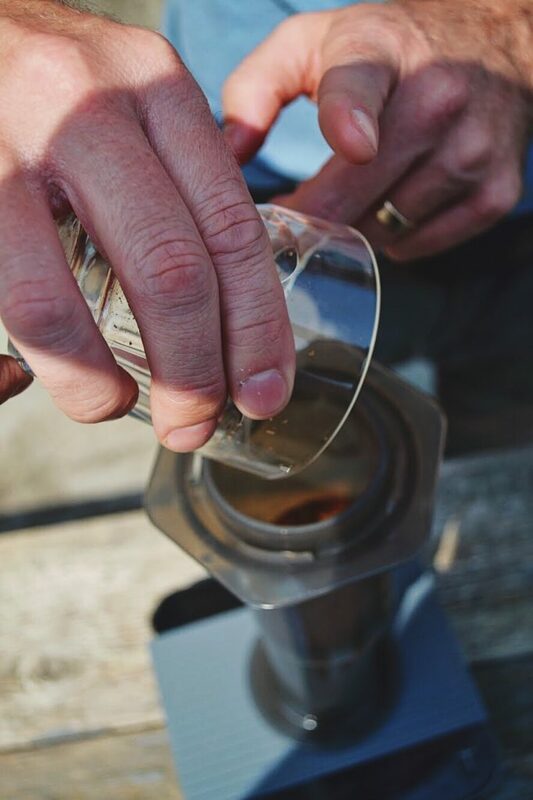 For brewing on the Aeropress we want about 17-18 grams of coffee. If using the scoop provided with the Aeropress, this would amount about about 1 heaping scoop of beans. (Scoops can work well, but weighing is objectively the most accurate method). Before grinding your beans the Aeropress needs to be assembled. 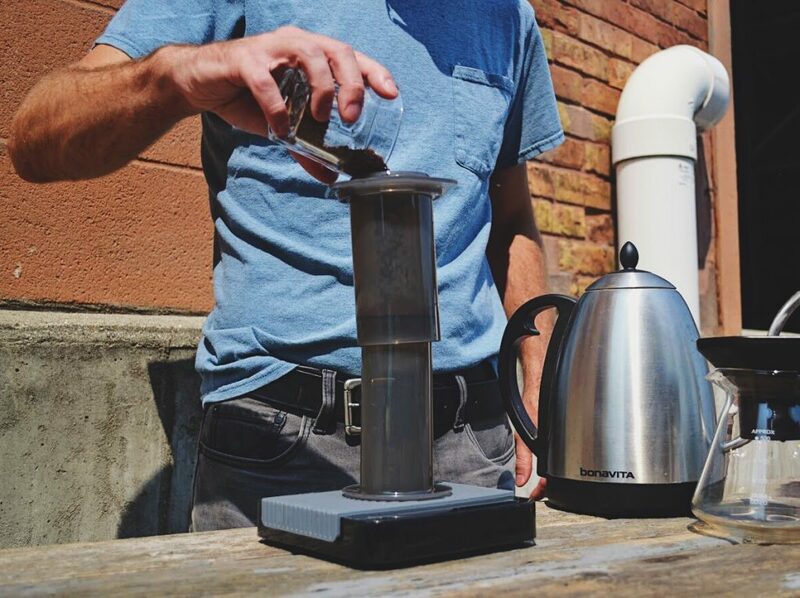 There are 3 main pieces that makeup the Aeropress: plunger, brewing column, and cap. 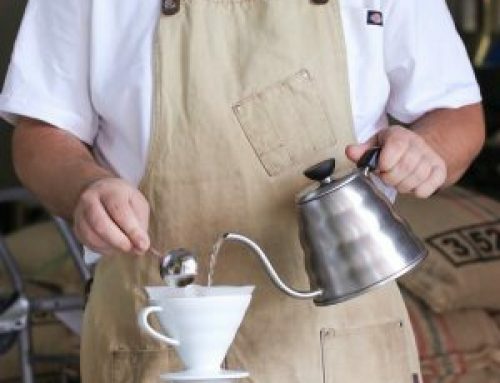 The “Classic” brewing method calls for the brewing column to point downward on top of a carafe (which will catch our coffee!). Attach the cap with one filter to the bottom of the column and place both on top of a carafe. Once these pieces are put together, rinse the paper filter with hot water and allow to drain before tossing the brewing water out. Once you’ve put the Aeropress together and rinsed the filter it is time to begin grinding the beans. For a classic brew we will want our grind size to look something similar to table salt. 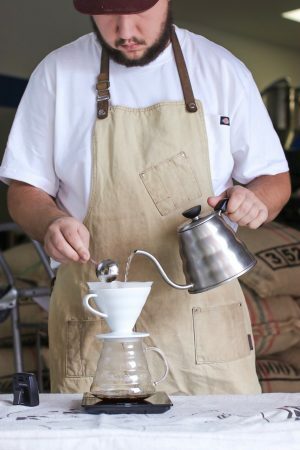 Once ground, pour the coffee into the brewing column. Shake the column lightly to create a flat bed of grounds. Now we’re ready to begin pouring. Start by adding about 60 grams of water. If you’re not using a scale, pour until reaching slightly above the #1 on the side of the brew column. After adding the water make sure to stir the coffee – this will ensure the water and grounds are completely mixed and saturated. After 30 seconds, add the rest of the water. With a scale this will be somewhere around 270 grams total, without a scale continue pouring until you reach the top of the #4. Allow this to sit for about 40-60 seconds. At 1:30 insert the plunger piece on top of the brewing column and slowly begin to push down. Be careful to press down slowly, allowing the coffee to move through the filter and into you vessel. Pressing too fast will cause possible spills (and lots of tears). Total brew time should be about 2 minutes.